Reasoning Under Uncertainty was a project funded by the National Science Foundation under its EHR/Applications of Advanced Technology program during 1985-91. The project led to a variety a publications and presentations (e.g., Rosebery & Rubin, 2007; Rubin & Bruce, 1991). Andee Rubin and I were the PIs, but the project eventually involved many other colleagues at Bolt Beranek and Newman, MIT, and local schools in the Cambridge, Massachusetts area. A centerpiece of the project was the Reasoning Under Uncertainty curriculum, a 285-page guide for teachers at middle-school, high-school, and college levels. We developed the curriculum through extensive work with students at Belmont High School and Cambridge Rindge and Latin High School. The curriculum conceived reasoning involving probability and statistics as central to both science and everyday life. One touchpoint was the daily Boston Globe, which never failed to have articles about elections, the economy, sports, fashion trends, and more, that could not be well comprehended without an understanding of concepts such as margin of error. Thus, we sought to expand the concept of literacy to include quantitative reasoning, or more generally, inquiry (Bruce & Davidson, 1996). Using both online and offline materials, students could work with existing datasets, such as one demonstrating the relationship between cricket chirps and temperature, or another from Boston magazine showing income, education, and health patterns for Boston-area neighborhoods. They could also collect and analyze their own data, such as license plate data from cars passing through a traffic rotary, which could be used to determine town location of the cars. A key feature of the curriculum was exploratory data analysis, allowing “what-if” investigations. This was facilitated by three major pieces of software, all written for the Macintosh computer: Elastic (1988), Sampling Laboratory (1990), and Statistics workshop (1991). The latter appeared later in a commercial version, published by Sunburst Communications (1992). This mathematics software program on statistics with teacher’s manual is for grades 6 to college and is a set of computer tools designed for helping students explore and understand fundamental concepts of data analysis. The software program provides a system for entering, manipulating, and displaying data; viewing a statistical summary of the data; and creating a variety of subsets of the data. 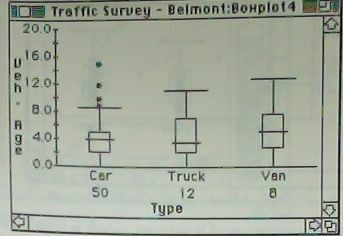 Four types of plots are available for displaying data: histogram, bar chart, box plot, and scatter plot. Included also in the software is a movable line that can be manipulated to fit the data points in a scatter plot. A fit meter shows how well the current line fits the data, and the equation of the line is displayed. The results can be checked against a best fit regression line with its equation. Another feature of the software is the ability to change a histogram by raising or lowering the bars in order to create a variety of distributions. The results of such changes on the mean, median, and quartiles can then be explored. The manual gives an overview of the software program; outlines teaching ideas; provides sample teacher directed and student activities; gives information on statistics and data analysis in our world; and explains the interdisciplinary nature of statistics. Other information in the manual focuses on the NCTM standards for grades 9 to 12 that relate to data analysis and statistics. A reference guide section of the manual defines terms and shows step by step how the program works on the computer. Bruce, Bertram C., & Davidson, Judith (1996). An inquiry model for literacy across the curriculum. Journal of Curriculum Studies, 28(3), 281-300. Bruce, Bertram C., Snyder, R., Rubin, A., & Lee, A. (1991, December). Exploring the Sampling Laboratory (Technical Report No. 18). New York, NY: Bank Street College of Education, Center for Technology in Education. Rosebery, Ann S., Mandel, A., Mili, P., Rubin, Andee, & Bruce, Bertram C. (1989). Reasoning Under Uncertainty: Developing statistical reasoning. (BBN Report No. 7220). Cambridge, MA: Bolt Beranek and Newman. Rosebery, Ann S., & Rubin, Andee (2007, June 8). Teaching statistical reasoning with computers. Teaching Statistics, 12(2), 38 – 42. Rubin, Andee, & Bruce, Bertram C. (1991). Using computers to support students’ understanding of statistical inference. New England Mathematics Journal, 23, 9-20. Rubin, A., Richards, J., Bruce, Bertram C., Conant, F., DuMouchel, W., Goodman, B., Horwitz, P., Lee, A., Mesard, W., Pringle, L., Rosebery, A., Snyder, R., Tenney, Y., & Warren, B. (1991, August). Final report: ELASTIC: Environments for learning abstract statistical thinking (BBN Report). Cambridge, MA: Bolt Beranek and Newman. Rubin, A., Bruce, Bertram C., Conant, F., DuMouchel, W., Goodman, B., Horwitz, P., Lee, A., Mesard, W., Pringle, L., Rosebery, A., Snyder, R., Tenney, Y., & Warren, B. (1990). Annual report: ELASTIC: Environments for learning abstract statistical thinking (BBN Report No. 7282). Cambridge, MA: Bolt Beranek and Newman. Rubin, A., Rosebery, Ann S., & Bruce, Bertram C. (1988, June). ELASTIC and Reasoning Under Uncertainty: Final report (BBN Report No. 6851). Cambridge, MA: Bolt Beranek and Newman. This entry was posted in Uncategorized and tagged ICT, literacy, mathematics, mybook, school, science, university. Bookmark the permalink.